Extreame Savings Item! Free Shipping Included! 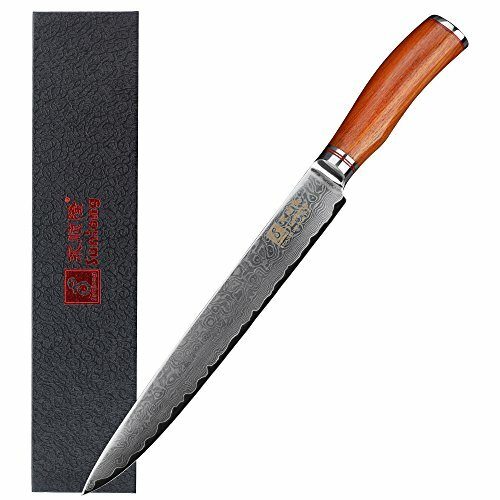 Save 50% on the Sunlong 10 Inch Sashimi Sushi Knife-Yanagi Raw Fish Slicing Knife-Japanese High Carbon VG10 67 Layer Damascus Steel-Rosewood Handle SL-DK10311RN by Sunlong at Mint MD. MPN: SL-DK10311RN. Hurry! Limited time offer. Offer valid only while supplies last. Material: blade: Damascus steel; Handle: 430 S/S ,rosewood , It is suitable for slicing raw fish and seafood into sashimi size. The length of blade is 10 inch , the thickness is about 2.5mm. the use of Japan 67 layer VG-10 steel core Damascus steel made of high quality cutting tools, HRC (hardness) 58-60, sharp corrosion resistance. The edge of the way for the double-sided blade, left and right hand can be used. Handle the 430 double elbow is one piece of die-casting molding, the outer is cover by environment and high-grade rosewood. If you use it , you can feel so comfortable and non-lip durable.